GIRLGROUP ZONE: [EXCLUSIVE] Favorite talks about their new song 'Where are you from? ', answer fans' questions and more in an interview with Girl Group Zone! [EXCLUSIVE] Favorite talks about their new song 'Where are you from? ', answer fans' questions and more in an interview with Girl Group Zone! Finally Girl Group Zone back again with a new interview after 4 months! This time we meet Favorite for an exclusive interview talking about their comeback and more. Check out their interview with us below! 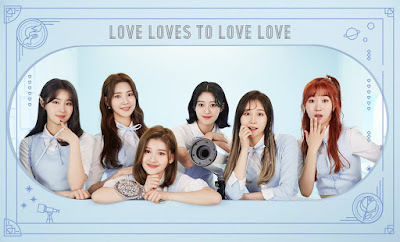 Favorite is a 6-member group under Astory Entertainment debuted on July 6, 2017. The members consist of Gaeul, Saebom, Seoyeon, Sugyeong, Jeonghee and Ahra. Favorite: You’re my Favourite ! Hello we are Favorite. Hello I’m Favorite’s Saebom, and I have a voice that’s warm like Spring. Hello I’m Favorite’s silly Seoyeon, dreaming of the next commercial top star. Hello I’m Favorite’s Idea bank, Gaeul. Hello I’m Favorite’s energizer, Sugyeong. Hello I’m Favorite’s Jeonghee, with eyes like a deer. Hello I’m Favorite’s Ahra, with pro reaction skills. Q. First of all, congratulations for your comeback with 'Where are you from?'! How do you feel about it? Favorite: Thank you so much!! We’re so excited and happy to be back in 9 months !! We tried our best preparing the album so we hope you all enjoy it. Q. Any difficulties or special training while preparing your comeback? Favorite: Unlike our first album, this album is full of our lovely and cute parts, so we tried to hide the chic side by practicing cute facial expressions. Q. What was your reaction after heard the title track for the first time? Do you like it? Seoyeon: My favorite is ‘Liar’ ! I like the melody and it goes really well with our voices. Gaeul: My favorite is ‘Heart Signal,’ because I made the choreography. Sukyung: I like ‘Liar.’ it makes me feel calm. Jeonghee: I like ‘Liar’ the best out of the four songs. Ahra: I like ‘Liar’ Because the melody is so pretty and I can listen to it whenever I want to. Q. Any memorable moments during music video shooting? Favorite: The set was so pretty so we were all so amazed. There was a neon sign that wrote 'Favorite’ and it made us want to bring it home. Q. What concept do you want to try next? And which member you think suits the most with that concept? Saebom: I have this enthusiasm towards girl crush. I want to try out a girl crush concept. I think Gaeul will be the best at it. Sugyeong: I want to try a concept like Dream Catcher. I feel like I’ll suit the most. Gaeul: I want to try Red Velvet’s ‘Bad Boy’ concept. I think Saebom will look very good. Sugyeong: I want to try something free, like Mamamoo’s ‘Starry Night’ where it has a good feel to it but still looks ‘free’. I think I’ll look the best through that concept! Jeonghee: I want to try something calm next time. Sugyeong can take out the chic and bright side of herself so I think she would look very good. Ahra: I want to try Red Velvet’s ‘Bad Boy’ concept as well. We all have a chic side so we all will look good. Q. To all members, Who is your role model? Is she/he inspired you to become an idol? Saebom: My role model is Taeyeon from SNSD. I used to sing her song ‘If’ while dreaming to become a singer. Seoyeon: Stephanie was my role model. I watched her dance on a tv show and that made me want to be like her. Gaeul: My role model is Hyuna. I watched how she rules the stage and so I wanted to be like her. Sugyeong: My role model is SNSD and Mamamoo. I wanted to become like SNSD ever since I was young. That’s how I grew my dream of becoming an idol singer. Mamamoo has great manners and sense on stage, and I think that’s amazing. Jeonghee: Eunji from Apink. I love her voice and also how she’s a great actress. Ahra: Suzy from Miss A. Not only as an idol, but she can act, and also be on commercials. I want to be like her. Q. Do the members live together in a dorm? If yes, who is your roommate? Favorite: We do live together, but it’s a one room so we’re all roommates. Q. Who is the mood maker in the group? Favorite: It’s Ahra. She has so much reaction! Q. Which variety show you want to appear on? Saebom: ‘Omniscient!’ I want to be like Ms. Lee Young Ja, and show people our favorite place to eat. I also want to show people how funny our manager is. Seoyeon: I want to be on ‘Happy Together.’ I watched it ever since I was young. So I wanted to be on it. Sugyeong: I want to be on ‘Idol Room.’ It’s a new show, so we want to help them find their concept. Ahra: I want to be on ‘Knowing Brother’ because Kim Young Chul came to me a while ago at a schedule and said hi to me. I was very thankful. Q. So Favorite have been on many survival programs such as K-Pop Star, Produce 101 and MIXNINE, What are your thoughts and feelings being part of those shows? Seoyeon: I was on Mixnine, and it was tiring to stay awake all night to practice. It was hard at first but as time went by, I got used to it and saw myself improving. Gaeul: I was on Produce 101 before my debut, and it was tough because I didn’t know anything. But I got to make lots of friends and learned a lot so it’s my most memorable program. Junghee: It was hard to practice with people I just met, but I got better and I became thankful for my members. Ahra: Through Kpopstar, I learned a lot for my vocal skills from the three judges. In Mixnine, it was hard because we had to make things to perform, but still that surely helped me improve. Both shows were all important. Q. What song you listen the most these days? Saebom: I listen to (G) Idle’s Latata. It’s very catchy! Seoyeon: I listen to our song ‘Liar.’ It’s very like my style, and I keep wanting to listen to it. Sugyeong: I listen to Gary Moore - ‘Walking By Myself.’ I like the blues genre. Junghee: It’s Stray kids’ - 4419. Ahra: Chawoo’s ‘I Miss You.’ I want to keep the song to myself, but it’s so calm and relaxing that I’ll recommend it for you! Q. If you have a chance to go overseas, which country your want to visit the most? and why? Saebom: Brazil and Turkey! Whenever we do V lives, we have comments from Brazil and Turkey. I want to go meet my fans there! Seoyeon: I want to go to Cebu. I’ve never been to a vacation spot, so if I get time, I want to go have some healing time in Cebu. Gaeul: I want to go to Portugal. Sugyeong: I want to go to Japan. I love ramen, so I want to have ramen there! Jeonghee: Japan! Kpop is very popular there, so I want to open a concert in Japan. Ahra: I want to visit Indonesia. Whenever we do V app, we have lots of foreign fans but we have many Indonesian fans. We promised them we would visit so I want to keep my promise. Q. To all members, Any group or member of the group you are close or want to close with? Saebom: I want to be close with Jisoo from Blackpink. She’s very cute so I want to talk to her. Seoyeon: I want to be close with Blackpink’s Jennie. I thought she was very cute and pretty and lovely, but when I saw her onstage, she has a girl crush side as well. Gaeul: I want to become close with Dream Catcher. Sukyeong: I want to become close with Gfriend’s Sin B. She’s very funny and it feels like we share the same gag chord. Jeonghee: I’m close with Dreamcatcher’s Siyeon, Dami, BerryGood’s Daye, ELRI’ Bella. Hyeseong and LOONA’s Hyunjin and Heejin. Ahra: Because of Kpopstar and Mixnine, I’m close with all the members of ELRIS. Also I go to the same school as UNB’s Kijoong and ELRIS’ Karin. Q. To all members, If you weren't an idol, what do you think you'd be doing? Saebom: If I weren’t to be an idol, I would’ve been a pharmacist like my mother. I always thought that she was cool and that it was a very good thing to do. Seoyeon: Probably a stewardess. I like learning new languages, and I think I’m good with service. I was interested in the job ever since I was young. Gaeul: I would’ve studied art and become a stylist or a fashion designer. I love Clothing! Sugyeong: Probably a dancer or a trainer at a music agency. Jeonghee: Anything related to perfume!! Ahra: I haven’t thought of anything other than an idol, but I do like children! So maybe a teacher..? Q. How do you feel knowing that you have fans outside Korea? Favorite: We’re very thankful for them cheering for us overseas. We hope to show them better work. Q. If you had to swap position with any other member, who would you swap with? Saebom: If I could change my position, Sukyeong! I want the best dancer position in Favorite. Seoyeon: Probably Saebom or Ahra for their main vocal position. I like people who are good singers, and I think it’s very charming. Gaeul: I want to change with Seoyeon because she’s she tallest member while I’m the shortest! Sugyeong: Gaeul because I want to try dancing like her. We’re both in dance positions, but we have a different style. I want to dance in Gaeul’s style. Jeonghee: Gaeul because she’s a very powerful dancer. Ahra: I want to change with Saebom. I was always the youngest anywhere, so I want to try being the oldest. Q. Do you have plans to write or produce your own music? Any artist you'd like to work with? Sugyeong: I have lots of interest in producing and writing music. While we were resting in between our comeback, I was learning a lot. One day I’ll try to write and produce a song for Favorite. Gaeul: If I get the chance, I want to try writing with Hyuna. Jeonghee: If I get the time then yes, of course! I would be so happy if our members would go onstage with a self-produced song. Q. What is Favorite goal in 2018? Favorite: Being in the top 100 music chart, and successfully finishing our 2nd mini album so that we can make another album this year. That was our interview with Favorite, hope you guys enjoy it and stay tuned for more interview! Thank you!